Asking for donations for your latest project or startup is as old as time itself, but organized “crowdfunding” — the process of trying to raise a significant amount of financing from complete strangers on the web — is a relatively new animal. How much should you ask people for? What kind of time frame should you be looking at? If donations drop off after an initial flurry of interest, is that a bad thing or does that happen to others too? 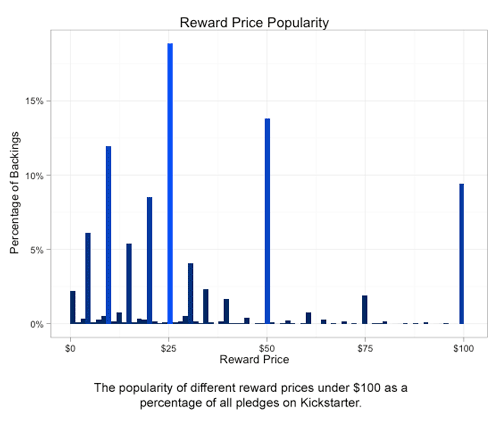 Kickstarter, a crowdfunding startup aimed at artists and other creative professionals, thought those questions were interesting enough to plow through all of the data it’s collected so far to come up with some conclusions, including why you should ask people to donate $50 or less, and why you should choose a shorter funding period rather than a longer one. One of Kickstarter’s best-known success stories is Diaspora, the open-source social network that some are hoping will become an open alternative to Facebook. The startup managed to raise $100,000 in a matter of weeks, thanks in part to some attention from several leading tech blogs. But plenty of other Kickstarter projects are somewhat less glamorous or high-profile. As Kickstarter advisor Andy “Waxy” Baio described it in a blog post after the launch, the service caters to independent artists who want to raise money for a creative effort, be it a book, a movie, a software application, a game, etc. According to Fred Benenson, who wrote the data post for the Kickstarter blog, the impetus for the data-sorting effort was an analysis that Kickstarter member Craig Mod did of the donations he received for his Art Space Tokyo project. Mod noticed that in looking at the top 20 highest-grossing Kickstarter projects, $50 donations (which the site calls “rewards”) accounted for almost a quarter of all the revenue those projects pulled in through the service. So Kickstarter ran through the data from all of its successful projects (i.e., the ones who achieved their funding goals). Among other things, it found that while $50 and $100 donations accounted for the bulk of revenue to successful projects, the most popular donation amount was actually $25. As Benenson notes, the total revenue raised by a crowdfunded project is obviously important, but so is looking at which dollar amounts users chose the most, because it is this “viral” effect that helps to produce momentum when a startup project is looking for money. As the Kickstarter staffer notes, “additional backers don’t only offer additional money, they also spread the word.” Although the $25 level only made up about eight percent of all the dollars pledged, it was the most popular donation amount, making up almost 19 percent of all amounts chosen. Next in line was the $50 level, which made up almost 14 percent of all donations. The Kickstarter post also looked at the pace of donations over time, and what it calls “the trough” (Mod called it the “dead zone”). After an initial flurry of donations when a project is first posted to the service, almost all projects see a sharp drop off in contributions or pledges, followed by a bumpy series of much smaller amounts, and then a pickup as the project gets close to its deadline, with a sharp jump just before the end. 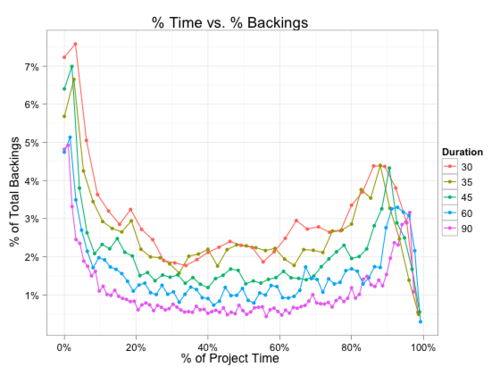 Kickstarter also looked at the optimum duration for a project funding, and found that the bulk of successfully funded projects chose a 30-day financing window, while unsuccessful ones were more likely to choose longer periods. For that info and more, check out the full Kickstarter post. And remember, if you’ve seen donations to your crowdfunded project fall off sharply, it’s not just you. It’s great to see crowdfunding getting coverage. If you’d like to know more, I’ve recently released the book “The Crowdfunding Revolution | Social Networking Meets Venture Financing”, which is available in paperback or ebook formats. I’ve been following crowdfunding for a few years now and it’s great to see the new class of sites – e.g. RocketHub.com, IndieGoGo.com, and of course Kickstarter – take the mainstream step that Sellaband and Fundable could never take. This is becoming a science.